The second, The Future of Car Ownership from the NSW motoring association the NRMA adopts a slightly more cautious timeline but reaches essentially the same conclusion about their impact. The third and perhaps the most comprehensive is Autonomous Vehicle Implementation Predictions prepared by Todd Litman for the Canadian Victoria Transport Policy Institute. 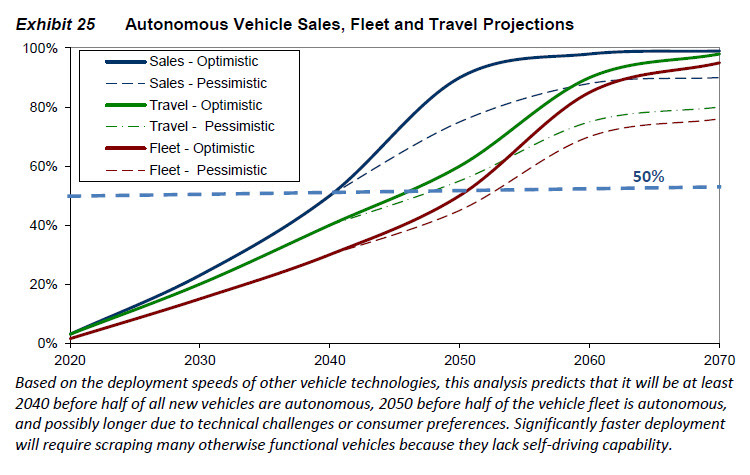 This has adopted the most conservative view of the speed of the roll-out of AVs, predicting their deployment will take closer to 30 years. The phase-out of petrol and diesel-based vehicles: The report claims the replacement of combustion-engined vehicles with electric ones will be complete by the end of the 2030s “at the latest”, but the end of their sales could occur (in the US) as early as 2024. The report argues this will pose “existential threats” to the oil industry, with price and volume collapses affecting all oil producing companies and countries, especially those with high-cost production. The appearance of autonomous vehicles: The switch to electric vehicles provides the basis for the swift development of AVs. According to the report this will have a profound impact on the millions of people employed as truck, bus and delivery drivers. The report claims that in the US alone “up to 5 million jobs may be lost, leading to aggregate income losses of $200 billion per year”. The demise of these jobs could result in social dislocation far greater than any we have seen previously. 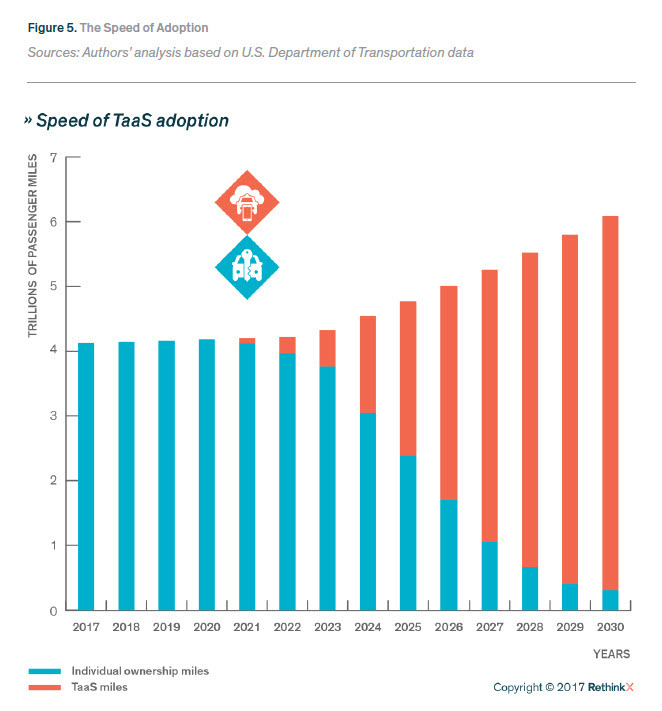 The widespread adoption of Mobility as a Service (MaaS): The evolution of Mobility as a Service (MaaS) – also known as Transport as a Service (TaaS) – in which users subscribe to services which provide trips tailored to their needs, regardless of mode or combinations of modes – is already underway but will accelerate with the introduction of AVs. The Rethinkx report confidently predicts the demise of private vehicle ownership in favour of AV-based MaaS, with claimed savings of “$5,600 per year in transportation costs, equivalent to a wage raise of 10%” for the average American family. Combined with the longer lifespan of electric vehicles, this trend is likely to decimate car sales and manufacturing. The report claims that the size of the U.S vehicle fleet will drop from 247 million in 2020 to 44 million in 2030, with annual manufacturing of new cars declining by 70% during the same period. The NRMA report – which considers the Rethinx report findings – concentrates on the impacts on car ownership. While it suggests that the rollout of completely autonomous vehicles won’t occur in Australia until at least 2026, it broadly agrees with the Rethinx findings particularly regarding MaaS. It notes the decline in car ownership and the number of licenced drivers among young people and the growth in ride sharing services. On the other hand, the NRMA notes that while most population growth occurs in Australia’s major cities, the vastness of the country and relatively low densities may slow the adoption of MaaS and AV vehicles. Whether or not to promote or incentivise the take up of connected, electric or autonomous vehicles separately or combined. Whether or not to set an active goal of no human driven vehicles. Whether to prioritise new public transport infrastructure over road infrastructure. How to price a new road network for access, use and finance repayments. Todd Litman’s Victoria Transport Policy Institute report questions the assumptions of a swift rollout of AVs implicit in reports like the Rethinkx paper. It also attempts to quantify the community benefits and costs of AVs and their impacts on public policy. The report notes that the most optimistic predictions are often made by people “with financial interests in the industry” and are based on the swift rollout of electronic consumer goods. AVs are a different case because of the range of complex issues involved, especially in moving from operating autonomously in limited trials to doing so under all road conditions, a process which will involve exhaustive testing. Litman also claims that because motor vehicles last much longer and are much more expensive than consumer goods “new technologies generally require many years to penetrate vehicle fleets”. In addition, he notes that autonomous driving could “induce additional vehicle travel which can increase traffic problems”. Autonomous vehicle implementation is just one of many trends likely to affect future transport demands and costs, and therefore planning decisions, and not necessarily the most important. Its ultimate impacts depend on how it interacts with other trends, such as shifts from personal to shared vehicles. It is probably not a “game changer” during most of our professional lives, and is only a “paradigm shift” to the degree that this technology supports shifts to more efficient and multimodal transport planning. Despite Litman’s conservative approach, all three reports suggest that the impact of AVs will be significant and will require substantial policy responses, regardless of the speed of their rollout. In future posts I will look at some of the planning challenges in more detail. This entry was posted in Autonomous Vehicles, Transport and tagged Autonomous Vehicles, MaaS, TaaS, Transport. Bookmark the permalink.